Most of Brewster’s observations are based in New England, where he split his time between two homes in Cambridge and Concord, Massachusetts. Brewster would stay in a cabin by the Concord River to study nature and escape city life in Cambridge. He also took notes when travelling: his notebooks document trips to the southern USA, the Caribbean, and Europe. Brewster’s writings contain a wealth of information, from data on temperature and weather conditions to descriptions of animal behavior and personal musings. 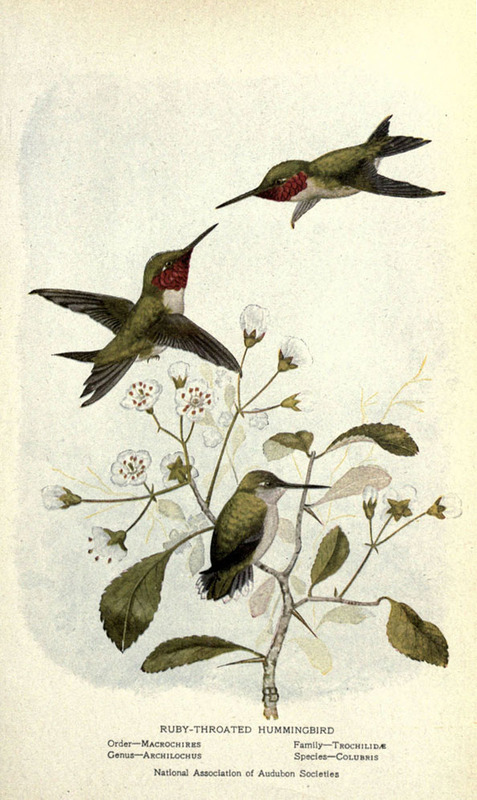 Some of the extensive Brewster collection is already available to view on BHL – here’s a sampling of the kinds of information you’ll find. Beginning in the 1890s, Brewster’s journals document a transition of focus from mainly specimen-collecting to photography and documenting behaviors. (His journals reveal an interesting story about his increasing ethical conflict and desire to study wildlife without contributing to its decline. You can read more about this in a previous BHL blog post found here.) 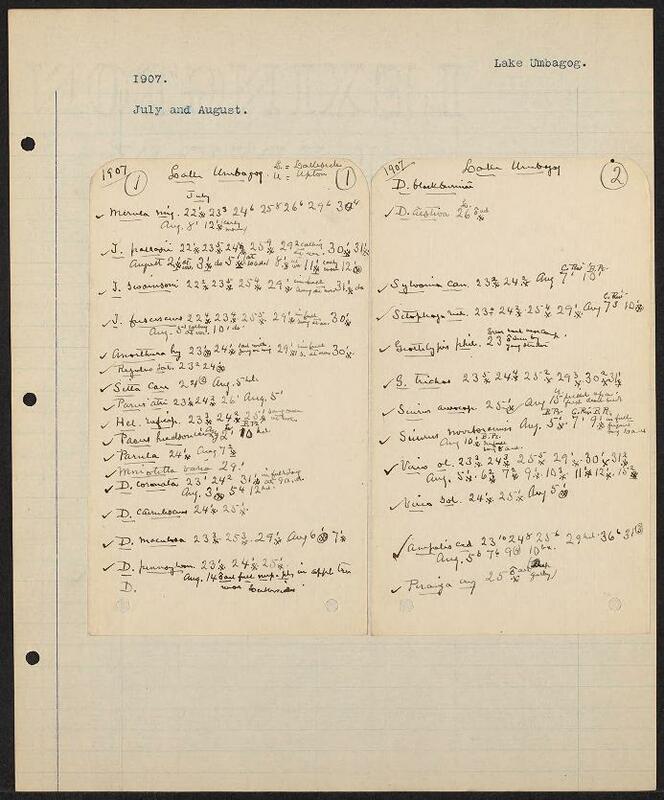 Earlier in Brewster’s career, his journals list and provide details on species collected – data that is similarly useful to the list above in that it gives an indication of species distribution and abundance. It also corresponds with existing specimens and documents the impact made by scientific collectors of the era. The kinds of data in these journals diversifies as Brewster started devoting more time to documenting animal behaviors. In many ways, this work seems to have been harder than getting a good shot at a bird. Even with today’s apps and audio libraries, figuring out bird calls can be a challenge. 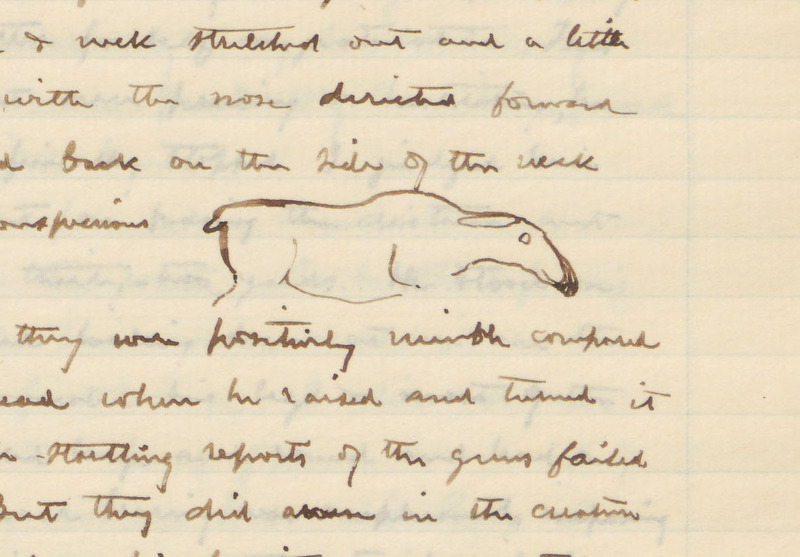 Equipped with just pencil, paper, field glasses and ears, studying bird vocalizations is much trickier, as shown by Brewster’s notes below from 1902. Today, we can represent bird vocalizations visually using spectrograms. In order to translate sounds to text, Brewster listened diligently to invent mnemonics, describe patterns, and make comparisons to other more familiar sounds. An image from one of Brewster’s journals showing his written renditions of an unknown bird’s vocalizations. He writes: “The voice was much louder than that of any Blackbird and was also more penetrating. The cry lasted from ½ to ¾ of a second (timed with a stop watch) and I noted the following variations: Kèt – kèt – kèt – ă – ă – ă – ă – ă (the a sounded as ah) [etc. ]” https://s.si.edu/2q6rKGa. A simple ink-sketched outline of a female moose with head held low and ears lying flat back. The sketch is embedded in a paragraph handwritten in cursive script on lined paper. https://s.si.edu/2GD0beA. Because he returned to Lake Umbagog year after year, Brewster was able to notice longer-term changes in familiar ecosystems. Increasingly, these changes were man-made disturbances: the clearing of woods, the creation of new roads, and other urbanizing changes. He also recorded how local communities of animals and plants responded after these disturbances. The following passages from Brewster’s field notes document some changes that he saw in the Maine woods as a consequence of logging for paper mills, and include some of his own predictions. “Where the road passes through the woods … the roadworkers last May cut away the mountain maples, cornels and other shrubs and low trees that made such a beautiful border to the forest clearing in their places a broad belt of bare rocks half covered with the fallen brush wood. This deed of vandalism was performed while I was here and at the time I feared that years must elapse before Nature, with all her diligence, could repair the injury. Knowing now that local extirpations and even total extinction can occur (this was the decade when the passenger pigeon disappeared from the wild), he would have penned this prediction with heavy heart. To help preserve an area he cared about – his familiar stomping grounds along the Concord River in Concord, Mass. – over time, Brewster purchased 300 acres of the riverfront. His ‘October Farm,’ across the river from Great Meadows National Wildlife Refuge, is now protected land with trails recently opened to the public – while his writings, notes and photographs preserve the region for us as he knew it in the 19th and early 20th centuries. July and August 1907. Journals of William Brewster, 1871-1919 (inclusive). Find this journal on BHL. June 1, 1902. Journals of William Brewster, 1871-1919 (inclusive). Find this journal on BHL. August 27, 1896. Journals of William Brewster, 1871-1919 (inclusive). Find this journal on BHL. August 15, 1896. Journals of William Brewster, 1871-1919 (inclusive). Find this journal on BHL. May 15, 1897. Journals of William Brewster, 1871-1919 (inclusive). Find this journal on BHL. Elizabeth Meyer is a Library Project Assistant at the Ernst Mayr Library of the Museum of Comparative Zoology at Harvard University.